D.C. is set to see a surge in dockless scooters and bike-share bicycles after a dozen companies applied for the city's new permits. The number of applicants by last week's deadline surprised even the District Department of Transportation. WASHINGTON — D.C. is set to see a surge in dockless scooters and bike-share bicycles after a dozen companies applied for the city’s new permits. The number of applicants by last Wednesday night’s deadline surprised even the District Department of Transportation, said chief project delivery officer Sam Zimbabwe. Lime, Ridecell, HOPR/CycleHop and JUMP applied for separate permits for both bikes and scooters. Those companies would be allowed to have 100 to 600 of each if their permits are approved. Riide applied for a permit for bikes only. Spin, Skip, Lyft, Wind, VeoRide, Razor and Bird applied for permits for scooters only. Each of those companies would be allowed 100 to 600 total if their permits are approved. Combined, that could add up to as many as 6,600 scooters and 3,000 dockless bikes. The permits also provide for increases in the number of allowable scooters or bikes every three months for companies that hit set usage and operational goals. “We will be allowing up to 25 percent growth, so up to 150 vehicles each quarter, based on meeting some performance standards,” Zimbabwe said. DDOT will now review the applications and hopes to issue permits by Jan. 1 to any of the companies that have shown they can comply with the program’s rules. The bikes are permitted to go up to 20 mph on level ground, and the scooters are permitted to go up to 10 mph on level ground. They can go faster downhill. Several scooter companies complained about that restriction before the application deadline. “We’re really excited by the amount of interest we saw from companies, including companies we did not know about before the application deadline, and we think that shows that the approach that we’re taking makes these companies see the District as a viable place to do business, and that we’re not stifling the market here,” Zimbabwe said. 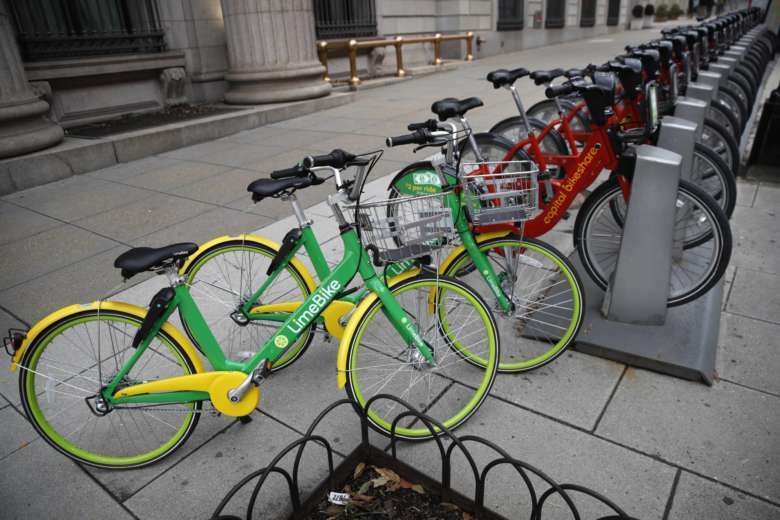 The District required fees of $325 as part of the permitting process, plus a charge per dockless bike or scooter of $5 per month based on when it first hits the street (i.e. $60 for a scooter that is made available to users in January, or $30 for a bike first made available in July). Each company must also put up a $10,000 bond or security that could be used to clean up abandoned or improperly parked vehicles if the company is not responsive, and have an insurance policy. The companies also must provide and report data about usage to the city, cooperate with requests for data made by D.C. police, spread at least some of their vehicles to all parts of the city each day, and provide a way to pay in cash without using a smartphone. Bikes are required to include a lock that riders use when done with a trip to lock the bike to a rack or other permanent spot. The companies are not allowed to put third-party advertising on their bikes or scooters. This is the first time the city is implementing permanent rules and permitting for the dockless vehicles. The companies already operating in the city have been doing so under a temporary pilot program that began in 2017. Since each of the companies was required to submit a standard application for a 2019 permit, Zimbabwe said the city can now get a better understanding of operations to determine if any changes are needed for 2020. “We’ll be evaluating the program overall … during 2019 to figure out if we keep the same approach or how it continues to evolve into the future,” Zimbabwe said. Montgomery County, Arlington and Alexandria each have separate procedures in testing periods. This does not replace the region’s still popular public Capital Bikeshare program, which is continuing to expand.